CBS ranks No. 10 in the world and No. 6 in Europe in Business & Management Studies. “This is our most impressive ranking to date,” says Dean of Education Sven Bislev. With CBS’ new ranking among universities worldwide, it’s not difficult to feel a sense of pride as a student at CBS. Quacquarelli Symonds, a highly respected institution, measures the quality of the world’s universities and has recently ranked CBS as No. 10 on its QS World University Rankings by Subject and No. 6 in Europe for Business & Management Studies. - This is unquestionably our most impressive ranking to date. 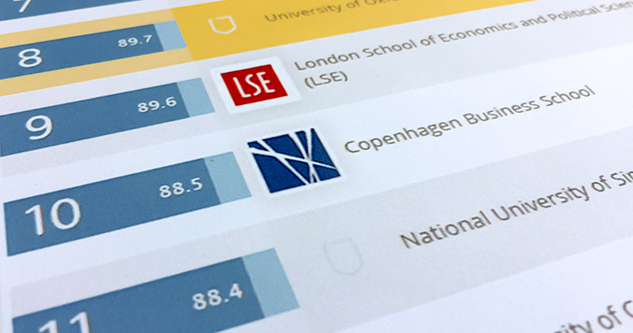 It’s a heavyweight ranking that measures the quality of research and reputation among employers and university colleagues. It’s great to receive recognition that CBS is on the right track. At the top of the list are recognised universities and business schools such as London Business School, INSEAD, Bocconi, Oxford and London School of Economics and Political Science. Business & Management Studies is a new subject on the list. Previously, CBS has only appeared under Accounting & Finance, where CBS was No. 40 this year worldwide and No. 9 in Europe. For more information please contact Vice Dean Sven Bislev. Quacquarelli Symonds gathers and disseminates QS ranking information about leading business schools and universities to students, potential students and to people with graduate, MBA and Executive MBA degrees, in addition to potential employers. QS World University Rankings by Subject are based on information gathered from 25,000 to 62,000 university researchers, employers and students, as well as data on scientific publications.